The community of Whitstable hosted a ten kilometre footrace this morning. How wonderful that Krista and I could say that we had to miss it because we have even more exciting things to do. Throughout our paddling adventure, Falling Down the Thames, the Met Office has been threatening us with forecasts of horrid weather. Day after day those forecasts have been overly pessimistic, and we have been provided with the most wonderful of paddling weather. At times it has felt as though we were living passages from Wind in the Willows. Now that we have arrived on the north coast of Kent, and are facing paddling that is, for all intents and purposes, on the ocean, we have to take threats of foul weather far more seriously. So when the Met Office Forecast high seas on Tuesday and Wednesday, with winds gusting to eighty kilometres per hour, we knew that a conservative approach was our only option. Krista and I were scheduled to meet the Oyster Morris dancers for some fun and silliness today, May Day. But with a promise of beautiful weather, we had to call that off, and prepared to paddle instead. 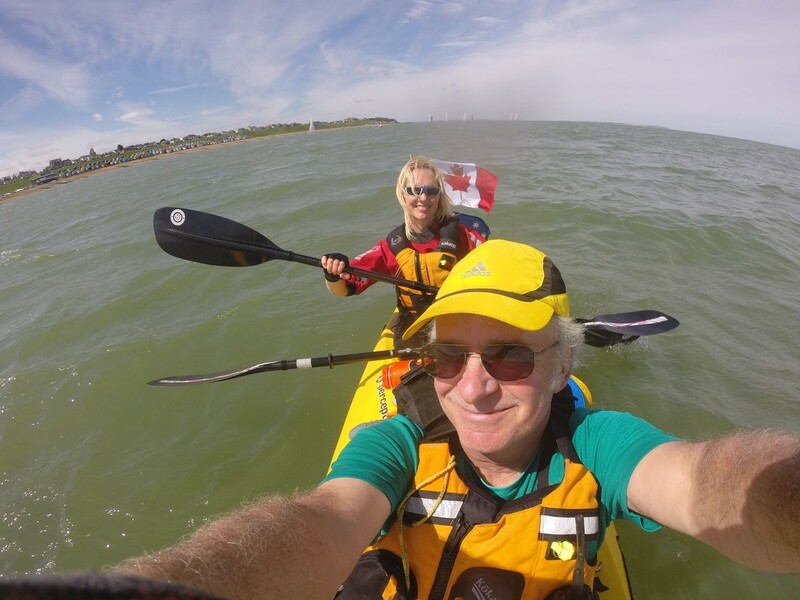 We set off from Whitstable in the kayak under a lovely blue sky. The wind was fresh, but at our back to help push us along. We agreed not to have a specific destination in mind, but to see how the day unfolded. To our right were runners following the race course along the sea front. To our left were giant wind turbines and the remains of the sea forts that helped to protect wartime Britain. We had planned to paddle the eight kilometres or so to these sea forts tomorrow, with the support of the good people at the Redsands Project. Regrettably the weather is likely to be far too foul. And so, when we arrived at the community of Herne Bay, we tried to do the next best thing. At one time, Herne Bay could brag about a lovely long pier jutting out into the sea. My mother told me stories about roller-skate dancing on the pier. A short segment of this pier remains attached to the shore, and its derelict terminus far offshore; the remainder is gone. We paddled around the once-great distal end of the pier, now home to gulls and pigeons. Aiming for the shore, we pulled the kayak onto Herne Bay’s beach. With salt-encrusted faces, wet hair, life jackets and spray skirts we did not look like the usual May Day holiday-makers in Herne Bay. Leaving all of our gear on the beach, we enjoyed cheese-and-tomato sandwiches and coffee at the bandstand. If I remember the stories correctly, my mother and her brothers would listen to musicians perform at the bandstand when they were young, and dance to their tunes. The wind shifted directions, and instead of pushing from behind, it had a go at pushing us out to sea. Not wanting to arrive in Norway on this trip, Krista managed the rudder with a delicate touch to keep us reasonably close to the shore. On we paddled. After five hours, we came to the community of Margate. The skies had turned from clear to heavily overcast, and I think I spied rain in the distance. Instead of pushing on to Broadstairs, we grounded the kayak on the mud-and-sand beach. I watched over our possessions, while Krista went in search of a place to store the kayak for the night. I looked back over the seas we had just paddled, and resolved the towers at Reculver as the tiniest sliver in distance. When we contacted Harry, he offered to simplify things by coming to Margate to retrieve the kayak and drive us back to Whitstable. While driving back, Krista commented that the car ride showed, in a way that a map couldn’t, just how far we had paddled. It looks as though the winds will have us landlocked tomorrow, but I am sure that we will have fun in and around Whitstable.